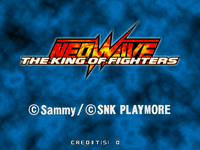 The King of Fighters Neowave is a 2004 2D competitive fighting game produced by SNK Playmore and originally released as a coin operated arcade game for Sammy's Atomiswave hardware. It was the first game SNK Playmore produced for the Atomiswave. Although a part of The King of Fighters series, it is not counted in the numeral progression established in the following game in the series, The King of Fighters XI (with KOF 2003 being the actual tenth game in the series). The game was ported to the PlayStation 2 and Xbox. The PS2 version was released only in Japan and the PAL region, while the Xbox version was the only home version released in North America. The character artwork was done by Tomokazu Nakano (of Power Instinct fame). The game reverts back to the 3-character elimination system from KOF '94 to KOF '98, ignoring gameplay features from later games such as the "Striker" system used from KOF '99 through KOF 2001 and tag team system in KOF 2003. The game's graphics consist of 2D character sprites overlaid over polygonal 3D backgrounds (similar to the 3D stages featured in the console versions of previous games in the series such as the Dreamcast versions of KOF '98). With the change of hardware from Neo Geo to Atomiswave, the number of buttons is now increased to five. In addition to the standard four attack buttons used in the previous games, a fifth button is now added which is used to activate the Heat Mode. Heat Mode will cause the character to blink red and increase their offensive strength, with the side effect being that the character's health will begin to gradually decrease. The player will return to normal after getting hit by the opponent or by pressing Heat Mode button again to deactivate it, and the player must wait awhile to activate it again. The player cannot use Heat Mode when the life gauge is in critical level. The player can select their own playing style similar to KOF '97 and KOF '98, from three different styles, which affects the techniques available to the player and the length of their Power Gauge. In Super Cancel Mode (SC Mode), the player has a three stock Power Gauge. The player can use Super Special Moves (which requires one Power Gauge stock) and MAX Super Special Moves (which requires two). With one Power stock, the player can cancel a regular move into a Special or Super Special move, and a regular Special into a Super Special. The player can also use one Power stock to cancel a guard into a Knockdown Blow or an Emergency Escape, or do a Quick Emergency Escape during a normal or command move. In Guard Break Mode (GB Mode) , the player has a two stock Power Gauge. Like in SC Mode, the player can perform Super Special (one stock) and MAX Super Special Moves (two stock). The player can parry an opponent's attack using the "Just Defend" technique, guarding against an opponent's attacks at the precise moment it makes contact with the character, allowing the player to follow it up with a counterattack. Using one Power stock, the player can guard cancel into an Emergency Escape or do a Quick Emergency Escape. The player can also perform a Guard Break attack with one Power stock, which is an unblockable version of a character's Knockdown Attack. In MAX2 Mode (M2 Mode), the player has a single stock Power Gauge. The player can perform Super Special Moves with one stock, as well as MAX Super Special Moves. However, MAX moves can only be perform when the player has only 25% of their life gauge remaining. Additionally, an exclusive MAX2 move can be perform as well under these conditions as well. In M2 Mode, the player can guard cancel into a Knockdown Attack. Source: Wikipedia, The King of Fighters Neowave , available under the CC-BY-SA License.